‘Tis the season… for parties, for fun, for celebrations, and well, for booze. You know what I love most about the holidays after the decorations? White elephant gift exchanges. And they don’t even have to be the “weird” gift exchanges. The regular ones make me really happy too. And you know what always does well at a gift exchange? Booze gifts. 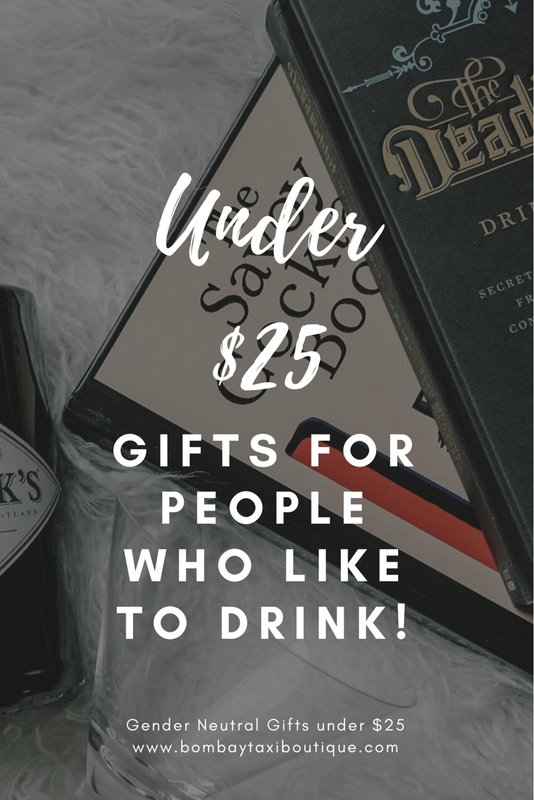 So today, I’m giving you the rundown of my favorite booze gifts - not only are they great gifts for a gender neutral gift exchange, but they’re also great host/hostess gifts or just generally good holiday gifts for people who like to drink. Gifts for people who like to drink: Ice Cube Trays for large ice cubes. Great for drinks on the rocks! Gifts for people who like to drink: wine chillers to instantly cool that glass of white wine or rosé. Stemless Flute that will keep your drink cold for HOURS $19.95. This comes in colors so browse for one you like! Drunk Stoned or Stupid $18.00 - ridiculous board games are always fun! Gifts for people who like to drink: who doesn’t love a ridiculous party game?! Cocktail Books: Nick and I own The Savoy Cocktail Book and The Dead Rabbit Drinks Manual. The Savoy Cocktail Book ($19.95) is a reprint of the 1930s edition, created by Harry Craddock who left the U.S. during the Prohibition and joined the American Bar at the Savoy Hotel in London. There he created some of the world’s most famous classic cocktails, including the Corpse Reviver #2, and popularized the Dry Martini. This book is particularly great for anyone who enjoys art deco or the 20s and 30s in general, and especially if they enjoy classic cocktails! Fun Fact about Harry Craddock - he was born in Gloucestershire, but moved to CLEVELAND and worked at the Hollanden Hotel! The Dead Rabbit Drinks Manual ($18.36) was created by the Dead Rabbit Grocery & Grog in Lower Manhattan - an American bar institution that has won practically every bar award worth winning, including World’s Best Bar and World’s Best Cocktail Menu. This book offers a modern take on classic cocktails, another must- have for any cocktail lover! Best gifts for people who like to drink: great white elephant gifts that people will actually want! 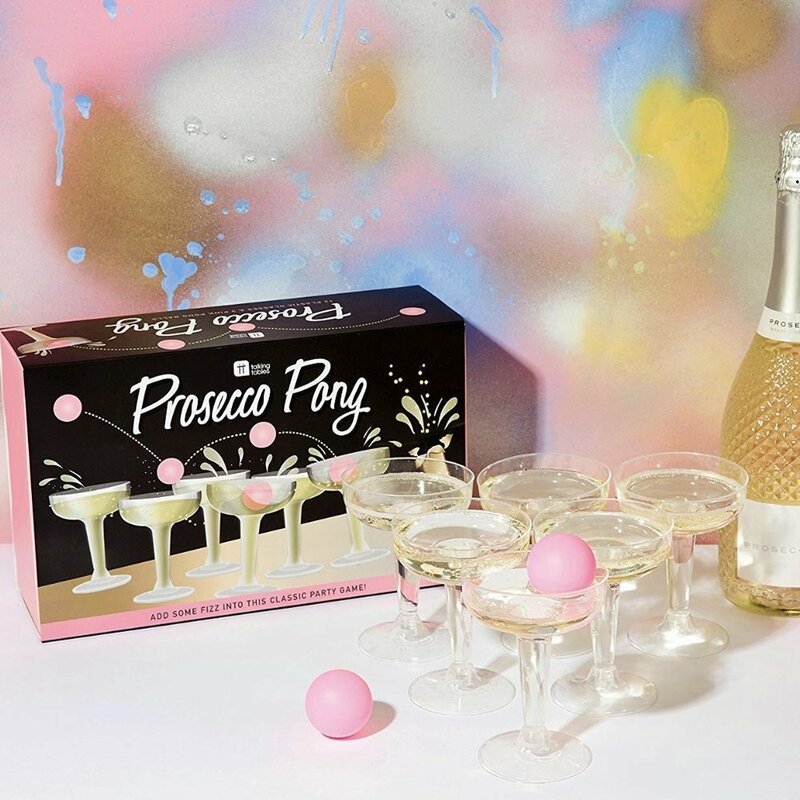 Prosecco Pong $18.59 - perfect if you like your drinking games on the fancy side. Gifts for people who like to drink: is this the best drinking game ever?! I hope you’ve enjoyed this gift guide and will use it this holiday season! If you like this post, you may also like our Gift Guide for Dogs (and dog lovers). Disclosure: This post contains affiliate links, which means that I receive a tiny percentage commission if you use any of the links provided to purchase these products. This has no impact on the price you pay. As always, all opinions are 100% my own - I only talk about products that I’ve tested and loved!